While Hillary Clinton appears at carefully controlled events, her most significant opponent for the Democratic nomination, Vermont’s independent senator, Bernie Sanders, seems to be willing to appear in less scripted gatherings. The result has been that Senator Sanders has taken the brunt of the #BlackLivesMatter frustration with the torpor of the Democratic party on racial equity issues while Secretary Clinton carefully cultivates African-American support behind the scenes, particularly with an eye to the South Carolina primary. That will be the first contest in which, unlike the Iowa caucuses and the New Hampshire vote, black voters will be a significant force in picking the Democratic winner. Sanders has had his public appearances disrupted on occasion by #BlackLivesMatter protesters who are calling the Democratic Party to account on the issue of racial equity—and Sanders is the immediate and convenient target. He hails from one of the whitest states in the union and his supporters appear to be largely white progressives. Without taking an ostensible stand for or against Clinton or Sanders (or Martin O’Malley, Lincoln Chafee, or Jim Webb, the other three Democrats who have declared for the nomination—and note that Harvard law professor Lawrence Lessig announced this week that he is exploring running as well), the BLM protesters have demonstrated how nonprofit activists can get involved in electoral politics without necessarily crossing the line of their 501(c) nonpartisan prohibition. Without much debate, the protesters have made an issue out of the status and privilege of white progressives who don’t elevate or sometimes even recognize issues of racial equity. Their critique is that progressives’ policy solutions emphasize economic issues but gloss over and ignore the significance of race. Liberal white racial do-gooderism is rampant in the racial equity movement to be sure, but some question whether targeting Sanders might be a bit off-point. As mayor of Burlington, Vermont, Sanders endorsed Jesse Jackson for president and had a long history of civil rights activism before and during his term as mayor. Challenging Sanders rather than Webb, O’Malley (who as mayor of Baltimore oversaw some of the police tactics that are being challenged today), or Clinton herself seems to let them off the hook and challenges the one candidate with a strong personal civil rights pedigree. Writing for Gawker, Hamilton Nolan suggested that the #BlackLivesMatter movement’s targeting of Sanders is misguided, “remarkably dumb,” and better directed at “someone who deserves it.” That leads to the common response that Nolan and others, including the participants in the Seattle crowd who tried to get Sanders to speak, are the all too typical white progressives telling black activists what to do and how to do it. Getting Bernie Sanders to speak about institutional racism: Nonetheless, one of the potential impacts of these disruptions of his speeches has been to get Sanders to explicitly address institutional racism and police violence. The speaker who introduced Sanders at the Westlake event, Washington State Senator Pramila Jayapal, said that she encouraged Sanders to speak about institutional racism at his second Seattle speech after having been prevented from speaking at the first. Not only did Sanders address institutional racism at the Seattle event, his campaign released a sweeping platform for combating racial inequities. Sanders spoke about his racial justice platform at a subsequent appearance in Portland, Oregon, in front of a crowd that has variously been put at between 20,000 and 28,000, depending whether the overflow crowd that couldn’t fit into the venue gets counted. In all fairness, it should be pointed out that Martin O’Malley’s campaign also released its own program on racial issues, though focused on criminal justice, but the campaign (among Democrats) that hasn’t yet is Clinton’s. Might the #BlackLivesMatter protests have pushed Sanders toward racial justice specificity that wouldn’t have occurred otherwise? That is the contention of the protesters. However, Sanders had actually described some of the elements of this agenda in July in a speech he gave to the Southern Christian Leadership Conference. Sanders has since reached out to new young activists for his campaign, rather than recruiting an entourage of presidential campaign insiders, notably hiring Symone Sanders (no relation to the senator) as national press secretary after she had contacted the campaign to offer advice; she was previously the youth head of the Coalition for Juvenile Justice. It is possible that he might not have necessarily been open to hiring that young African-American woman had it not been for the protesters making the case that the senator had to address racial issues or else join the crowd of politicians making supportive statements on race but offering little or nothing specific to stand out on the issue. The controversy, nonetheless, comes back to a split in the progressive movement. Some progressives question whether the Black Lives Matter movement has undermined the campaign of the candidate who might be most likely to offer concrete policy responses to the issues they raise. To these critics of the BLM activists, this might be yet another instance of internecine warfare within the left that weakens the candidates the left might otherwise support and hopefully see to victory. Others suggest that it is critically important for BLM activists to shake up the comfortable world of white progressives, including those typically aligned with the Sanders campaign, to make them grasp the seriousness of racial inequities in this country. 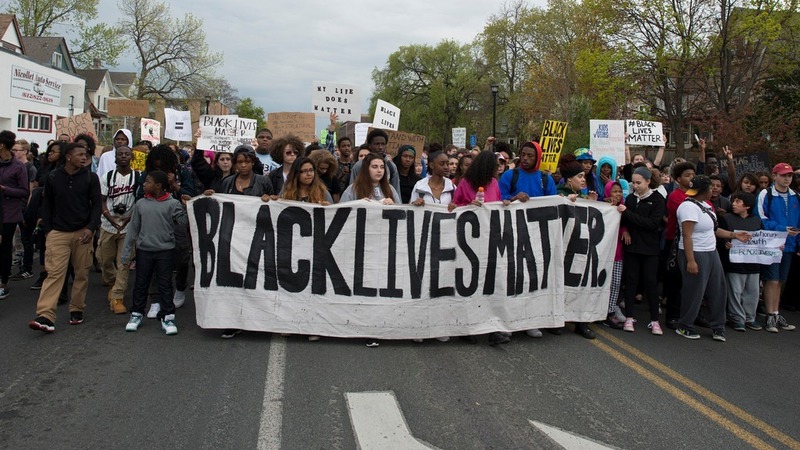 The #BlackLivesMatter disruptions, in their view, compel politicians like Sanders to address institutional racism in order to adequately respond to the dynamics unleashed after the killing of Michael Brown in Ferguson. As an example of the problem of challenging Clinton, Black Lives Matter protesters showed up at a Clinton event in Keene, New Hampshire, last night. Five BLM protesters were excluded by the Secret Service from the main event, a scheduled community forum on substance abuse, but were allowed to sit in an overflow room to watch Clinton’s speech streaming live. After the speech, Clinton met with five of the protesters “behind closed doors,” but neither Clinton nor the protesters described what they discussed. One protester, Daunasia Yancey from the BLM chapter in Boston, said Clinton acknowledged that “she had been part of promoting (policies) that have not worked,” but any specific policies she might have meant weren’t detailed. Hillary Clinton will certainly bring to the discussion her work in the 1970s for Marion Wright Edelman, later the founder of the Children’s Defense Fund, as evidence of her civil rights commitment. Critics, however, might raise questions about her long connection with members of the Walton family, one of whom, Alice Walton, has donated generously to her 2016 presidential campaign, and with the Walmart company, on whose board she served for six years, long considered by the left as having supported policies that exacerbate the kind of inequities that the Black Lives Matter movement is confronting. While the BLM activists have finally gotten some visibility with Clinton after two disruptions of Sanders events, the Sanders platform on racial issues may become a benchmark for measuring whatever specifics might emerge on the topic from the Clinton campaign.